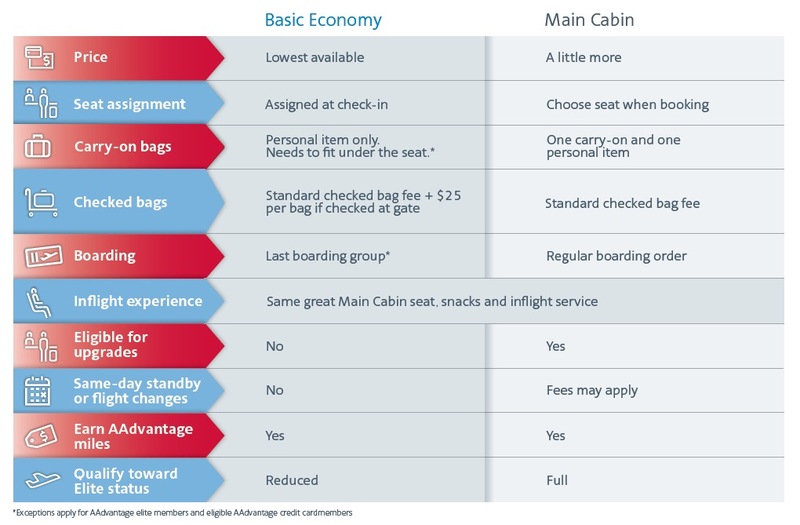 Newsroom - American Airlines Introduces New Basic Economy Fare - American Airlines Group, Inc.
American Airlines (Nasdaq:AAL) today announced it will begin selling Basic Economy fares in addition to the wide range of Main Cabin fares currently offered. These no-frills tickets provide a simple and affordable way to experience American’s network, and provide customers the option to pay for the services they want. Bags – One personal carry-on item that fits under the seat (such as a purse or small backpack) is allowed. No overhead bin luggage may be brought on board. Larger carry-ons such as a rollerboard bag must be checked at the ticket counter for the applicable checked-baggage charge. Basic Economy customers who bring more than an under-seat personal item to the gate will incur regular checked baggage charges plus a $25 gate service charge per bag. Elite customers and eligible AAdvantage® credit cardmembers will be allowed to bring one personal item, one rollerboard, and they maintain their current free checked bag allowance. American is committed to helping every customer find the ticket price and service that’s best for his or her travel needs. 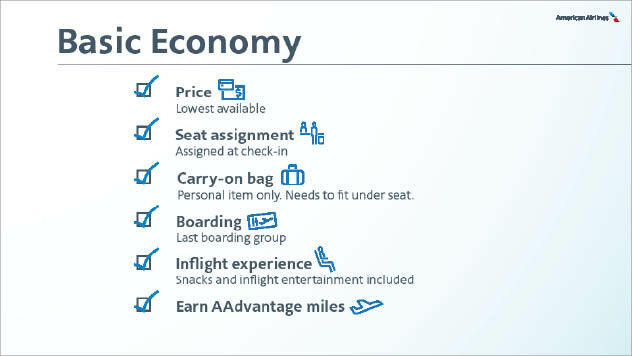 Multiple disclosures will spell out the attributes of a Basic Economy ticket at the time of purchase on aa.com, and when utilizing the airline’s reservations phone centers or when booking through a travel agent or online travel site. In addition to clear disclosures at the time of purchase, Basic Economy customers will also receive reminders as their travel day gets closer, including at check-in kiosks at the airport. In general these fares will be lower than regular Main Cabin fares in the same way that Main Cabin fares are lower than Business Class. The idea is to give customers a choice in the kind of ticket they want to purchase. It’s not a new discount, but a new set of attributes for our lowest fares. The number will vary depending on the same factors that affect pricing generally. We’ll introduce Basic Economy in ten markets and expand in line with customer interest. Just like with other fare decisions, we’ll always be evaluating the right mix of products to offer our customers and we may change those offerings depending on customer demand. Why not charge Basic Economy customers to bring a large carry-on instead of requiring them to check it? We hope that limiting carry-ons to a personal item will result in fewer bags in overhead bins. For Basic Economy customers, planning ahead to check a bag at the ticket counter or kiosk ensures a smoother travel experience without worrying about bin space. What happens if a Basic Economy customer brings a bag to the gate that doesn’t fit under the seat? They will need to check that bag at the gate and pay the applicable checked-baggage fee -- $25 for a first bag, $35 for a second bag, etc., including bags checked at the ticket counter. They would also owe a $25 gate service charge per bag for checking a first or second bag at the gate. (No gate service charge on bags 3+). Once on the plane, Basic Economy customers have the same in-flight experience as anyone else in Main Cabin, including complimentary soft drinks and a snack. They sit in regular Main Cabin seats. 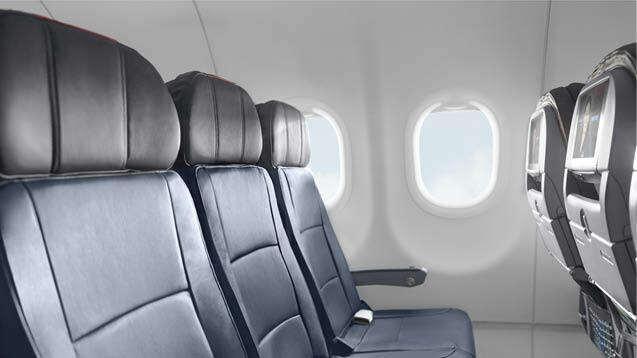 American has no plans to alter its seats or the interior of its aircraft for Basic Economy.